Charlie is Issacs dog who travels with him and rides shotgun in his truck. His podcast is about traveling the roads and meeting Americans while tracing John Steinbeck’s route in “Travels With Charlie”. Issac’s podcast is an interesting journal and tantalizing journey, well worth the effort of listening. In 2017 Issac interviewed Forrest. When that interview was published in May of 2017 it chased many folks away from looking for the chest in the Yellowstone area because although Forrest claims to have spent about 19 of his first 20 summers hanging out in that park and nearby, Forrest mentions in the interview that he has not been back to Yellowstone since 1950. If this is true, Forrest could not have hidden the chest around Yellowstone, since it was hidden well after 1950. So why bother going there to look for it? The question seems reasonable. The logic impeccable. Forrest visited West Yellowstone and Yellowstone National Park many times between 1950 and 2010. This is not something I made up…It is fact. And it begs the question; why did Forrest say he hasn’t been there since 1950, when he certainly has? I think I know what happened…but lets start at the top..
FENN: I was a professional fishing guide when I was 13 years old. FENN: No, in Yellowstone. West Yellowstone, Montana and I could… I ran a tackle shop all by myself. The guy that owned it was drunk all the time, so one summer I ran the tackle shop. I could make a gross of ﬂies in a day and wait on customers at the same time. But you know, I tied catgut leaders, tapered leaders, I made split bamboo fly rods. I had a name for every fish in that country up there: Mary and Phyllis and Johnny and I knew where all the holes were. I’m an outdoors person. It wasn’t so much fishing, it was being there. I remember when I could hardly wait to get on the river, and catch a big old brown trout. I’d get out there, get out of my car and look around and walk over and sit under a tree for an hour and watch the Osprey catch fish, and watch the Eagles try to take it away from the Osprey. God has a summer place up there you know? COLE: I haven’t fished up in West Yellowstone but I grew up going to uh, a cousin of mine owns Campﬂre Lodge. FENN: What’s the name of it? COLE: Campﬂre Lodge. It has a little restaurant there and log cabins and it’s right on the Madison. FENN: That’s after my time. FENN: Because I spent 19 of my first 20 summers, three months, in Yellowstone or West Yellowstone but the last time I was up there was 1950. Unfortunately no such follow-up was asked and no clarification about that statement has been made by Forrest. So then, why do I say that Forrest has, in fact been back to West Yellowstone and Yellowstone after 1950? Where is my evidence? I will share a few pieces of evidence that I have with you. First is the construction of the Dude Motel in West Yellowstone. Forrest, his brother Skippy and friend and brother-in-law Donnie Joe built the Dude Motel which is still on Boundary Street in West Yellowstone. They also built a tavern behind the motel, but the tavern is no longer there. Forrest wrote a story in his book, Too Far To Walk, about building the motel. I don’t believe he mentions the year it was built in his story which appears in Chapter 19 of the book. But Forrest answered an email from a searcher in 2011 and we published the relevant part of that email here on the blog. In that email Forrest states that they built the motel in about 1962. Second is Crayton’s recollection from somewhat later. Crayton is Forrest’s nephew. 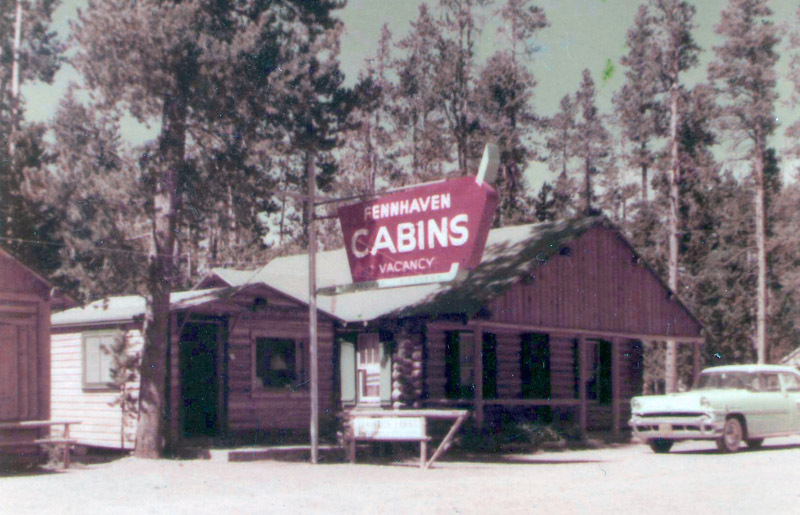 Remember that Forrest’s mom and dad ran a motor-court called Fennhaven Cabins in West Yellowstone in the 40’s, 50’s and 60’s. When they sold the motor-court they bought an airstream and still spent their summers up there. Crayton has vivid memories of Forrest and family spending time in West Yellowstone in the summers to visit his mom and dad and do a little fishing and relaxing. Crayton’s best memories of those visits are from around the end of the 60’s to the early 70’s. Third is a photo Forrest showed me in August of 2011. I can’t show it too you because I don’t have it. I was visiting Forrest in Santa Fe and we were sitting on his back porch sipping cold drinks and looking at some photos from his collection. One he showed me and talked about was taken just a couple years earlier. It was of Forrest and Peggy and another couple standing at Forrest’s favorite bathing hole, Ojo Caliente, on the Firehole River. The photo was taken from the bridge that crosses the river and looking down at the folks as they posed for the pic. Forrest and Peggy in the photo looked exactly as they did in real life on that day. Because of their age in the photo it could not have been more than a few years old. So, why did Forrest say that he had not been back to Yellowstone since 1950? But Forrest is not referring to the actual last time he was up there…He is referring to the last time he was up there for an entire summer (three months). So, in my opinion and based on the info stated above (and more)…Forrest just meant to say something that he didn’t. He had one phrase in mind and he spoke another. The interviewer didn’t know enough about the situation to follow-up on it. But, if you don’t want to waste your time searching around Yellowstone…no problem. There are plenty of great places to waste time looking at the splendid beauty of the countryside…eagles, osprey, buffalo, bear, trout, ants, beaver, otter…. This entry was posted in Important and tagged Forrest Fenn, thrill of the chase, Treasure, yellowstone by dal. Bookmark the permalink. I agree. Yellowstone has many treasures to enjoy. Will you be in YP the week of June 3rd, by any chance? Thanks for the heads up on Yellowstone , I do have a beef with the Park Boundary extending into another state. You mean 3 states. Idaho, Wyoming and Montana. Thanks for sharing Dal. Hopefully one of Cynthia’s 100 spots doesn’t match one of my three or four spots there before I search in July. What’s up with the One Horse motel in West Yellowstone? Coincidence in relation to the One Horse Land & Cattle Co.
Great story Dal!!! And interesting find Kal… Maybe Cynthia can check it out… But isn’t the chest not related to a Structure? And not below a man-made object? hmmm, Boundary and Madison. Where else have I heard boundary? Fennhaven was located at 216 Boundary, a few blocks North of the Dude. I want go to YNP just to see it, treasure or no treasure. That’s a very plausible explanation Dal, and I have no reason to discount it. I spent the first 4 months (2016) of my research in Yellowstone (mostly the Queen’s Laundry, Slough Creek, & the Norris area) and found the perfect blaze, a huge rock in the middle (Me in the Middle) of the Gibbon and shaped exactly like a arrowhead. But it just never seemed right, legal ponderings and the like, and then something caught my eye and I moved to a different area. Hands down Yellowstone is one of the most beautiful and scenic places I’ve ever seen, but I just don’t think it’s there. Thanks again for hosting such a great blog. If one was to find the chest in Yellowstone Forrest has stated that his attorney says that they would have to take it to the park superintendent. I just wonder if there is a better way for Forrest to find out if the treasure has been found than to have someone from the park contact him about it being turned in. I don’t know but it beats a camera or sensor theory. And does it matter if you have to turn it for 30 days? You turn in the treasure, FF tells them he left it, then it’s finders keepers right? All that I have found is that you cannot keep things found that are natural to the park. In all honesty Aaron, I’m no longer interested in National Parks of any kind, so if it’s in one of them, then I’m out luck. Regarding the 30 days in a vault comment, if we’re to be the fortunate one, that chest will see the darkness of a safe deposit box within a few hours of being found, and there it will stay for a while until I have time to hook up with a lawyer, speak to an accountant, and return the bracelet to Forrest. Also, IMO there’s something inside the chest making it seriously worth your while to contact Forrest, whether you want to return the bracelet or not. Like clear title to the chest and everything inside, but his lawyer must be involved for legal reasons (remember attorney-client privilege) or say the keys to his “replacement” Plymouth Tudor, or something valuable like that so you have to contact him to learn where it’s located. All that being said and if it were me, once I find it, I plan to guard it from a safe distance and retrieve it after dark as I think it could be in a tourist/public area. But there ain’t no way I’m handing that thing over to the “authorities” if I can help it. Just think how long it would take to do a complete and concise inventory of everything in that chest. It would all have to photographed and catalogued as a minimum. And how would the “authorities” know the stones are really precious, not to mention the carvings and jewelry value? No thank you. I’ll take my chances and “keep my secret where” ………. I want to. Gosh, I sure hope Sherif Billy and his posse don’t arrest me if it comes to that. Good luck and have fun this summer as I’m sure you’ll be out there before me. I can’t get out until late August/September this year. f said there are 110 diamonds in the chest among other things. When the chest is found, I’m going to have the deputy take inventory. If any are missing, you have crean yourself a warrant. You could only hope to be arrested by the deputy! Put 110 with in the pile of curious numbers…10,200, 140, 66,000, 2.055, 103, 42, 32 and all the others. 1f Billy and the deputy. If the chest is in a national park, And if I’m lucky enough to find it and get it back to my vehicle unseen by authorities, there is no way on Earth I’m stopping off at the local ranger station to “turn it in”. Nobody I know would do that and I believe the finder of the chest will be much smarter than that. I believe there will likely be some legal instructions in the chest so that the finder will know the right thing to do. The sheeple “Mary Poppins” types astound me. Aaron, According to FF if you find it he gives you the title, so it is yours and you do not have to turn it in for 30 days, “take the chest and go in peace”. very simple IMO. I wouldn’t take a chance of not getting it back in 30 days. In regard to going back, FF talked about taking his grand kids to the bathing spot- I believe he said something to the effect that he was disappointing that they were not very impressed with the idea of bathing there. I think Dal is right on about the quote is about spending the summer there. Only logical explanation. I agree with Dal. He clearly said that he spent 19 summer vacations there as a young man and hasn’t done so since. People are quick to misinterpret Fenns statements as secret clues. I have never thought that Yellowstone or West Yellowstone could be ruled out as the possible hiding place. What about pg 39 in TFTW where F discusses fishing with granddaughter Lucca? It doesn’t say definitively that he (F) was with her but implies they fished Grayling Creek. Maybe someone can do the math better but I’m guessing that would put him in the West Yellowstone area ~ mid to late1980’s if he was indeed with her??? It is funny how a little phrase can be misconstrued or misspoken. That a word can come out wrong, having an unintended nuance.Whether a spoonerism or a Fennism, we just have to hear all and listen good to get the gist of it. If not near Yellowstone, then maybe beneath Santa Fe Baldy. Down the east side of the Winsor trail to Cowling, NM…near the Pecos river. I tried to send you a twitter. Wanted to chat. I’m not a twitter adept so I might have bolluxed it. I did not receive a message on my twitter. Sorry. Put Thrill of the Chase in the subject. There are many stories, interviews etc. that has fenn in or about the ‘greater YS area’. I find it hard to dismiss the area because if this one interview. Seeker: concur. Forrest has absolutely been to YNP since the 1950s based on TFTW alone. Isn’t the point that if he, let’s say is bending the truth , what else can we take as gospel that he has said. Except what’s in the poem? this told me that ff was saying something else. Because Campfire Lodge was there when ff was. IMO. My family and I camp and fish on Hebgen Lake about 25 days a summer. Campfire Lodge has a great breakfast ! On a Side-note words could have been minced (maybe) around his cousin owning Campfire Lodge before Fs time….then, as F recalled the exact spot on a slight delay, he says he hasnt been THERE (Campfire Lodge) since 1950. I only offer as a POSSIBILITY since Campfire lodge appears to have been there since 1922. Given its location on the Madison it seems F would have likely known it back then….even if it took a minute or two to make itself known from that distant shelf of Fs memories. JDA – Sorry for the double posts. Sometimes I am at a location where my posts don’t go through, so I go somewhere else, and post them again. Mr F is def a sly fox. The new season is almost here Jonesey1! BTW Jones…you look like my British neighbor…LOL. Haha…no Ohio…North SLC. But I did consider a job in OH about four years ago. Decided to stay and continue with my bros doing construction. Jonsey1 – See my post of that painting of the old Campfire Lodge from inside the cafe. I agree with your assessment. But you could verify all that by talking to Jim Slattery, the current owner and Cole’s cousin, on your next trip. And that fly shop at Campfire Lodge, which he owns and operates also, is excellent. And Jim is usually the one cooking the awesome breakfast and lunch in the cafe. And I have enjoyed watching Osprey diving for trout from my campsite right on the Madison there for hours. Didn’t he also talk about tethering a small rubber float raft to his belt and drifting down the Madison from just inside the park? In preface of TFTW. Something that Peggy “allowed” him to do…thus after marriage & after 1950? Yellowstone area or bust! I think the Dude is a big time Clint (hint + clue). Maybe I can summon the ghost of RR to guide me to the goods. Hello Jmeils. Another story in “TFTW,” Mr. Fenn states he met Joe Rivera in his officer in 1974. Mr. and Mrs. Fenn, and Joe were fishing at the Gallatin River; photo shown on page one hundred and forty. Just noticed your name makes a good anagram. In the TFTW book, does FF only tell old or more current stories as well? Does it highlight one state more than another? Or exclude some state in your stories? In your opinion does it direct the reader to a specific region? Maybe Denver will agree…I don’t see one specific region as focus in the TFTW scrapbooks. Heck sakes, he even talks about Mexico Beach, FL. Of course the story was fishing related. I don’t thing he ever mention Brazil, Chile, or Uruguay in that book – prob no coincidence and the treasure is not likely in Argentina…tho Patagonia does have some amazing fishing. Hello McB. Tried to respond yesterday, but my post didn’t show. In “TFTW” book, all four states have been mentioned. The majority of the stories are told about West Yellowstone/Yellowstone, and Santa Fe/New Mexico. It may be that it was just the stories Mr. Fenn wished to tell. His stories will vary with age because of the stories told in this memoir. Hello McB. In “TFTW,” all four states are mentioned in one way or another. For example, the cities/towns of West Yellowstone, Meeteetse, Denver, and Santa Fe. In my opinion, many of the stories told are of West Yellowstone/Yellowstone and Santa Fe/New Mexico, but could be as simple as telling his memories of these places he wished to share with the readers. Hey Travis… You think there’s maybe a way he secreted in in such was that its discovery and the events that followed may force that same government to define/redefine their own rules. I choose to believe that IS where it may get really interesting. 🙂 …or at least I hope. Perhaps someone should call to the National Park Service/Yellowstone. Its no secret that a lot of people are looking there. Thanks for the info Splinters. Just as I suspected. Hence, how he may know. I work part time for the park service. If you find the chest I will be glad to take possession for you and notify Mr Fenn. How will the finder know it’s you? The takeaway here is not to turn the chest over to Anyone. Even an official looking squirrel wearing a ranger hat. The blog title scared me! And then I finished reading it. Thanks for the breakdown Dal! I’ll be back to YNP in July. The good thing about these bureaucrats is that they are bound by their own rules. Regardless of lawyers consulted or not and any current laws concerning someone finding and recovering the chest,things change. Laws can change at anytime as easy as the landscape of the land they govern. If the decision to hide his treasure was based on the laws as they were in 2009-2010 then he would have had to expect it to be found soon after that. If there was any legal consideration. Otherwise all bets are off. For all anyone knows the land the chest is on could have be reclassified already. Here is a good example. At a place near ( within a mile) where I live you used to be able to search for gold. Not mine, but search without staking a legal claim with the state. This included both dry land and in the river that flows there. 4 years ago that changed, now you can only keep what you find in the river unless you stake a claim. Hopping that laws will stay the same for a few years much less 1000 is folly. National land is reclassified every year for many reasons mostly mining and oil and gas exploration. So either he had a really crappy lawyer (possible) or Mr Fenn did not take the possibility of laws changing into account ( seriously doubt it) or there is something everyone is not seeing as it concerns recovery of the chest regardless of what class of land it is on. Private land ownership is the only one defined in the Constitution last I checked. Even that can be changed. I am not searching on private or tribal lands. That leaves “Government” lands – be that BLM, National Forest or A National Park or State Park. If I am omitting something – sorry – but Land over which there are government regulations. Being a “mostly” law abiding citizen, if and when I find it, my plan it to “Just take the chest and go in peace.” My intention is NOT to take it to a Ranger station or anything that would resemble a ranger station or other “Government” office. Sometimes the simplest explanation is the best. I think Forrest simply meant he hadn’t been able to spend a whole summer, as in three months in a row, up there. Just my humble opinion. And so I asked Forrest and he responded. if Isaac didn’t ask the follow-up and Fenn didn’t clarify, whats this?? May 17, 2017 – Podcast 2- https://www.ontheroadwithcharlie.org/podcast/2017/5/17/9c9a9oki9ig6h8oq9u7jv4gx1makgz — @~1:08- So I emailed Forest and asked him if he’d like to clear this up? Hi Loco: I was going to post the same link because I thought this had been settled last year. I concluded that Dal might have missed the follow-up question from Isaac. You gave sound proof of Mr. Fenn going to that area since the 1950’s. And, I love your title. Great research and write up Dal. There’s something about those early years where you forget about after the 50’s. Excellent story Dal! We just fell in love with the entire Yellowstone area. Coreda, Ming and I will be heading there in about three weeks as well. We need to make a stop in Bellevue, NE for our grandson’s high school graduation. We are really excited about the entire trip! Dal can you tell me why Fennboree was changed to the 23/24 – the same date as the Function at the Junction in West Yellowstone? I can’t JDA. I’m not involved in the planning for either of those meet-ups. But exactly how they both got to be on the same two days is something I know nothing about. I don’t think either of those events is expected to be as large as Fennboree has been in the past..
You could start your own meet-up in MT at some other time. I am sure there will be people there who would like to get together all summer long..
Look here for Fennboree activities and Forrest’s participation. For what it’s worth, I didn’t see it as anything other than him talking about when he spent summers there when he first said it, so I’ll add my thumbs up to that. I dunno the extent of his involvement in that, but I think it’d be weird to be involved at all, have your own plane, but never visit. There’s also him talking about his day trips by plane in the Moby Dickens video, to places including Lander, WY. In TTOTC (Flywater) he doesn’t explicitly say it, but implies that he was at his parent’s fiftieth wedding anniversary at his sister’s house in Bozeman. He’s all over that place. I don’t think anyone searching in Yellowstone or the surrounding areas have any issues making a case for it. I made a comment re: Fenn-Heath Properties on this site and it was deleted! (Maybe adding the link helped). I dunno. It was just something I came across when looking to see if Donnie was part of the treasure hunt. I don’t think it’s related, just included it as an example of close ties to the area. Based on what I read, my understanding of the transcript is; Mr. Fenn didn’t state exactly where it was that he hadn’t been to since 1950. I don’t care to read too much into what he has or hasn’t said. He is a rather coy individual, but if I were to throw out a guess, I would say he was referring to the Madison river because Cole had just mentioned it in the interview. Perhaps he has been back to Yellowstone, he just hasn’t been on the Madison since 1950. I think Yellowstone is still in play. Just a thought. IMO of course. Dal, did you take that picture of the Dude motel light? Nope. It’s from the web. I was too lazy to go dig mine up from the archive. Thanks Dal! I just read this morning that the Yellowstone Bears are waking up and in search for a nibble. I’m taking the family to Ojo in the fall, after all of this studying it’ll be nice to put some eyes on the place. I’ve always thought it was the route to Yellowstone that was the most important. The 1600 miles of good old fashioned, non air conditioned, irritating family chatter. I always remember the “getting there” more than the actual destination. A pretty place in the middle. It’s exciting to think that nature is starting to wake up and shake off the winter. I’m ready for it. Well I would say it’s the home of brown. Brown what? BROWN TROUT! for posting. And thank you for your article in Hemispheres in-flight magazine. It’s what introduced me to this treasure hunt (close to 3 years ago). FF’s interests in real estate companies may explain the “title to the gold”. He may own the land. But, I doubt that his name will be in the directory. A few years back I looked up land conservancy properties in New Mexico. I was hoping to find one that that I could fit to FF. I found one that was named “Anonymous” that gave access to Tesuque creek trail head. But it did not exceed 8.5 miles from Santa Fe as I measured. I could be wrong. It is a nice hike. I was suspicious about the use of the number “1950”. So I searched my Atlases of the Rocky mountains and found a forest road by that number. It runs adjacent to a heavily searched area. I would normally just say where it is. But a searcher is there right now. And he was there a day before Dal posted this topic. So, good luck to John Brown. an unrelated reason. Thanks for posting. IMO. I don’t think that “title to the gold” is related to real estate investment. Did he end up flying there to fish, or just that he was going to? Off topic, but do you all think anyone will find the bells? tfocus, …I’ve often wondered about that. But it will probably take a considerable amount of time. They are buried deep enough that you would need a great metal detector to even remotely stand a chance at finding one. Nervous because if it has fenns biograFFy then wouldn’t it make sense that the solve to the poem is written in it? I don’t recall when fenn started burying the bronze bells… but it seems unlikely the information in the bio would tell of the solve. More than likely [depending on when they were buried] the poem would be in the bio, for the finder of a bell to go and search for the chest. Or, they are not related to each other at all… the challenge vs. the bells. The one thing that seemed important to fenn was, for the bells, not be found for a very long time. Hence the reason he buried them deep deliberately. Cole’s dog may be Charlie, but Steinbeck’s was Charley. For those who suffered through Grapes of Wrath, Mice and Men, or East of Eden in Lit 101 and aren’t aware — Travels with Charley is a delightful easy read, especially for those who do road trips (and searches) with their dogs. I think Cynthia could definitely relate. FWIW — Steinbeck thought he was dying and wanted to do something before leaving our realm. Hmmmm — now that sounds familiar….. If excluding any treasure hunting, what amount of time is required to “see” Yellowstone? And by see, I mean highlights, but not rushed (if that makes sense). I don’t think it’s in Yellowstone, but I would like to visit, maybe after the chest is found. FMC – you could spend a year and still not see all of Yellowstone. I would spend at least a week or two. I concur, Covert One. Family goes nearly every year to Yellowstone since 1996, stayed a week, and still haven’t seen all of Yellowstone. A week or two to see the main attractions is definitely a good start. Tried four days once, and knew since then that it wasn’t enough time. Just don’t go there in mid-summer. The traffic congestion in and outside of the park is hideous. The park gets about four million visitors a year and most of them are on the few highways in the park at the same time you are. It can be a mess. It can take hours to get from the West Entrance to Old Faithful…and when you get there you have to wait to get a parking place and then stand shoulder to shoulder with a hoard of folks all hoping to point their phones at the geyser when it pops. However, In June just before school lets out and in fall soon after Labor Day…the park is beautiful and practically empty…and your visit will be much less aggravating. FMC, DAL HAS GOOD ADVICE. FROM MID JUNE UNTIL ABOUT A WEEK PAST LABOR DAY,, YNP IS NO FUN. I just spent the last 22 hours on the road. Drove to West Yellowstone spoke with several people. Many of the forest service roads still have major snow drifts in them and deep ruts in them from water run off the rivers are all high. The lower basin has had numerous Grizz sightings. I hiked a road for about 3 miles to see if my truck would clear many drifts, still lots of snow. While walking followed LARGE GRIZZ TRACKS, for about 100 yards. Please be careful if headed out now. Most snow at 5000’ is melted any higher will be an issue. Travis, thanks for the update here on the snow conditions. Here’s a link for snow conditions in and around the area you mentioned. Still much snow in some areas. Be careful. fenn stated he consulted lawyers, said he spent thousands of dollar asking about…. ~what if there is no legal question~ comment. Understood. We loose land to both government a private industry more often than people know. I’m not sure even the government can keep track of it all. Here is a thought, what if you solve the poem and your solve takes you to private land. Private land that just happens to be FOR SALE. Would you buy it? Or if it is public land where you are allowed to stake a claim. Either way both would be leagal as of today. Hi Ronaly. Glad you like it when I respond to your posts – some do not. C’est la vie. Heck yes, just to eliminate any possible problems. Or if it is public land where you are allowed to stake a claim. Either way both would be leagal as of today. – Again, yes. If it was on land on which I could stake a claim, why not? It would seem to simplify things. I do not think FF lies about anything, but I think he expanded the search area when he released the TFTW book. The hunt was going too fast and people were coming “too” close to the chest. Many people passing very close to the chest was “before” him talking about the Rocky Mountains. The TTOTC book itself does not refer to RMs, but only to the mountains “to the north” of SF. The first quote about Rocky Mountain came from a journalist who questioned FF by saying that mountains north of Santa Fe would go to Alaska. From there he began to refer always to the “Rocky Mountains”. And that made me wonder if many researchers at the time were between NM and CO.
And an FF friend said that FF would not hide the chest in a place that would cause problems. McB – Thinking while you sleep. * Sorry for errors of translate. Hello Beard. Perhaps rereading the poem and matching the clues to the map and check out the area where you believe the treasure chest may be. If you found the treasure chest, then you’ll know you understood the poem. The Campfire is a good place to get a tasty breakfast. It’s a small place so they can’t serve many folks at once. It’s also the entrance to the area where you can get a good look at Ghost Village…and the fly shop there is frequented by fishers and fly tiers of all beliefs. Parade Rest Ranch is also a fine place to get a good and reasonably priced breakfast. They have a dining room for their lodgers but anyone can walk in and pay for breakfast. No menu…just a nice breakfast for $10 in a fun, old fashioned lodge setting. Also, a wave to the folks over at the Happy Hour Bar. OK, not for breakfast but an afternoon or twilight burger and a beer…on the deck overlooking Hebgen Lake…elk burger if you’d like…can’t be beat. Ou foi por falta de IMO? Amber is yellow,and yellow is brown.just me thinking again. I keep thinking Yellowstone Park is too obvious, because of park being so famous for it’s hot springs. But I am new to this chase and did not know till a few days ago that FF spent so much time there growing up. Usually when we are young is when we have some special place in mind that is a fine and private place to be. So, the treasure could very well be hidden in a place when Forest was young. But did he visit any other part of the Continental Divide during his youth? If so, where? @Francise T. Forrest has a lot of information on his blog. If you’re new to the chase you may not know about his blog. It’s call Old Santa Fe Trading Co. It has a lot of great stories about his life and plenty of other places he’s been. 45 hours divided by 10 (hrs/day) = 4.5 days Sp, 4 to 5 days / trip. Just booked a room for next week, to celebrate early retirement….. but alas, we’re going for the treasure of the Steamboat, as it has been unusually active the last 2 months. Best luck to everyone starting their searches in the coming weeks. Congrats on the retirement and good luck with Steamboat. I’m hoping it’s active in July. Hi, this is my first post on this site. My solution to the poem has been and is exactly one solution and it is in Yellowstone. I searched yesterday and failed. I think at this point (after years of people searching, deaths of people, my own and other people’s failure) it should be stressed to all searchers for their safety and to prevent their heartbreak that Fenn’s poem is highly subjective, that it emerged from the mind of a man who is seeing in a particular way, and in order to crack the poem a person necessarily passes through all the perils of subjectivity. Take Fenn’s scrapbooks, such as the much discussed 107 or the one of him seeing faces in tiles in his shower (I believe 125), or the picture of him with his hat and bear in background. Not to mention all the images, allusions in this book Thrill of the Chase. A person tackling Fenn’s poem is probably not tackling something on the objective side, a view that the majority of people can easily agree with, but is tackling something in the sense of trying to see what is dangerously close to how a person with an illusion or at worst how a mentally ill person might see things. Fenn might think he is being objective, but the poem is obviously written to be difficult, and there is just too much evidence of him being one of those people with excessive levels of dopamine, one of those people science has determined because of increase of dopamine likely to see patterns in things people with lower levels of dopamine do not see (read up on this science literature). This of course is problematic on so many levels, not to mention on the level of having thousands of people grappling with the illusory and the real. It truly is highly philosophical and dangerous. I haven’t decided yet whether to post my complete solution to the problem for the public. But I believe if I were to do so people would agree I have an interesting take on the poem, one worth pursuing fully. The problem is I could in fact have an extremely high degree of match to the solution but precisely because Fenn’s view is highly subjective I could have a close match but be completely off, chasing an illusion which does not match Fenn’s illusion which just happens to be an illusion which does match where the treasure is located. I hope people understand the last sentence I just wrote. It is highly philosophical. If people are wondering who I am, by what comprehension and life experience I am tackling the poem, I have no education to speak of, I am a high school dropout with I.Q. 134 who has spent years (I am 54) reading and thinking heavily. I have also had to struggle with mental health issues all my life. I have had to struggle all my life to make sense of myself and things. And this is why I tackled Fenn’s poem. The treasure itself to me would be a help (I am in financial straits), but the big challenge of it is the philosophical challenge to come to terms with my mind, to test its ability to distinguish between illusion and reality. I figure if a methodology can be devised for seeing into the subjectivity of people it would be a tremendous aid to science, a breakthrough in everything from psychology to art to cryptography. Last I would like to thank people like Dal and Mindy for their Fenn websites. It’s been a pleasure and challenge to read their thoughts. Let me think a bit before I decide whether to post completely my solution. I’m discouraged now and have to decide whether to pursue this further on my own or put a solution out there for the safety and help of all. I agree with the opinions of Cynthia and Aaron that encourage you to hold on to your solution for a spell to see if might work in another place – much like what you said in your long winded philosophical sentence. What if you have the right “vision” but the wrong starting point? You would be giving the solution to someone else that had the correct starting point. Please continue to hang out here and offer some different insight into the fray. Hi Daniel-very interesting thoughts. I agree with much of what you said. I would suggest posting your solve if it brings you peace. I have a solve I almost posted and then withheld it because I was afraid I’d jeopardize someone else’s search area. So instead I typed it up and have been sending it to searchers who seem to think similar. I can still share it, but I choose the recipient. It’s been very rewarding for me after many months of little help. Look at where others are invested, decide if you like them, then reach out. It can’t hurt. Good luck to you Daniel and thank you for sharing. I would say that you not only have to think like Forrest, you have to be able to outpace him. Perhaps you are just the person to complete the task. One search does not a solution make…or something like that. I have been on 16 searches to my general search area. Each time, I returned home and reevaluated. Each time I could see where I had made an error in judgement or evaluated something slightly wrong. The “Solve” was good, it was just my interpretation of what was physically there, and my interpretation of how the poem depicted those things that was in opposition to each other. Extra dopamine or not – You appear to be a very intelligent person. Keep using that intelligence and do not give up so easily. Do you have the basis of a correct solve? Maybe yes, and maybe no – Only time will tell. The Chase is a challenge. Forrest has thrown out the challenge to us all – I secreted a treasure – unlock my secret. You have the kind of mind that just might figure it out. Daniel…I love your post. Indeed, the dopamine connection is fascinating and explains many of the varied experiences in perception we experience as humans. Both ancient and modern shamans deliberately learn to increase dopamine production to “see”. The definition of a shaman is “one who sees in the dark”. Indeed, we must walk in his shoes, so to speak. Until we “see” as he sees, all the hints and clues in the world will continue to leave us guessing. I agree Cynthia. While it is impossible to think exactly like Fenn it would be best to put ourselves in his shoes as best we can. Attempting to understand what he appreciates and most importantly, why he appreciates them is a step in the right direction. Why he hid the chest. What was going through his mind. Taking all of this and attempting to walk through a process of how he would have gone about writing a poem to show us the way to go, so that it difficult but not impossible. Aaron- it is not impossible to think like Fenn i think. Hi Cynthia, I’m familiar with your Fenn site–I have it bookmarked along with the Mindy and Dal and Jenny sites. If I were to reveal my solve it will be for the following reason: I believe the Fenn poem to be highly subjective, that although it has as its object the treasure chest it is not a poem with a clear embedded message that can be decrypted but must be interpreted by seeing as Fenn, which means it’s extremely dangerous because people can read all sorts of things into it and get themselves into trouble. Worse, the poem has as its object Gold, that which plays on human weakness, greed, desire to read into things what one wishes. And still worse: People for years now have been reading this and that into it and because everybody is pitted against everybody else and wants the Gold people are no doubt repeating failed attempt after failed attempt to solve the poem. I’m thinking about revealing my solve because at the very least it will be one solve out in the open and able to be crossed off the list once it’s thoroughly checked out, which is to say it will be one mistake, if it is a mistake, no one need repeat. If every person were to reveal at least their failures and entire reasoning process up to failure then we all would have a much clearer grasp of the problem and zero in on the solution for the good of everybody really, not to mention those poor souls wandering here and there wasting money and possibly even dying in their attempt. But people on Fenn sites seem to be even keeping their failures secret. I can’t recall anyone not only revealing a failed solve but giving us their reasoning process behind it. It’s like we’re all in the grasp of a subjective dream of Fenn and not making any objective headway because we won’t share our interpretations out of hunger for gold; we would prefer to be delusional and wrong time after time because we feel we might just sometime get the dream of Fenn right and get the gold. If I were to reveal my solve I would like it to be in a fair and square group type setting, that for example you and Dal and Jenny and Mindy and others get to hear it all at once. I would certainly be disgusted if some undeserving scoundrel were to profit from my solve. In fact I don’t think it’s possible to be an evil person and figure out the solve. My solve certainly has much about it that depends on a type of nobility, a nobility which of course Fenn himself probably has in greater abundance. But certainly to solve it in my opinion one must be removed from pettiness of thought. I’ll think over whether I want to share my solve. I’m morally conflicted, undecided to share it because caught between wanting the glory of correct solve and gold for myself and wanting the chase finished because so many people are caught up in it chasing delusion after delusion to no foreseeable end. In other words, I want to share my solve to help others out of their delusions, or at least to cross one their possible delusions off the list, but I want to keep it for myself because I want, like so many others, the glory and the gold. A true moral dilemma. And I think I might fail to share it; I think I have to try one more time (go and search) to determine whether my solve is correct. IF you were to publish your solve, how would that help me? Do you know where you went wrong? Are you going to say, “I was correct up until clue #? – and it was there that I went wrong.” If you know where you went wrong, fix it and try again. If you do not know where you went wrong, how can it help me other than to say your end spot was wrong. Was the end spot wrong because you messed up clue #9, or because you picked the wrong wwwh – so were wrong from the start? Sharing failed attempts accomplishes NOTHING, because we do not know WHERE we went wrong. – MAYBE. Every failed trip I have learned something. I reevaluate, fix what I think is broken and try again. Did I fix the right thing? I can only hope. I am SURE this time, but I have been sure before. Time will tell if I have fixed ALL of my boo-boos. There are a lot of failed solves on this site. Perhaps you should look around more. I’m partial to my own previous attempt and feel I explained my thought process pretty well. Cynthia also has solid solves – maybe start with those? Also, it’s subtle (so at least you have that going for you) but the implication that your solve is going to be some kind of eye-opening gift that must be fairly bestowed on those you deem Worthy is some serious hubris. Imo. Daniel, how long have you been in the Chase? I think the treasure is in Yellowstone, and the more I think about the treasure hunt the less happy I am about it for a variety of reasons. The first reason is that Fenn’s poem is highly subjective, it’s not something that can be cracked by cryptographers or it would have already been cracked. Second, this subjective poem has an objective goal which has played historically on human weakness, greed: Gold. Which means thousands of people are trying to crack a subjective poem, reading this and that into it, going out searching, and not telling anybody about their solves, which leads to repetition after repetition of illusion, people not learning from each other’s illusions and probably same mistakes made over and over again. And what’s supremely annoying, is people keep insisting Fenn did not put the treasure in a dangerous place when obviously the true and extreme danger of the poem is its subjectivity and people reading this and that into it, going here and there, wasting money and time, and in fact people are dying searching for the treasure. And still nobody proposes everybody share their solves in a concerted group attempt to close out the search. Still nobody seems at all interested in the lessons Fenn himself stated in his book that we should learn: To love each other, to have a kind word, etc. So we have thousands engrossed in a subjective poem, each person out for the gold, reading this and that into it and who knows how many times people have repeated each other’s mistakes. I’m seriously thinking about just giving away my only solve for the poem. The only problem with that is if there’s anything in it someone will try to steal the solve or dash to look into it or who knows what will occur…It’s true nightmare: Everybody engrossed in something subjective but nobody really willing to talk about it, reveal true thoughts, solutions, because it might lead to the personal loss of the gold and somebody else winning…I’m not sure I want anyone repeating my mistakes. Would a stout hearted man want someone repeating his mistakes? I would have to disagree on a couple points but they are my opinion. You don’t need to be a cryptographer to solve. Maybe a cryptograFFer. Lol. Fenn worded things so true in the poem it’s almost unreal, at least in my solve. Folks just aren’t listening to the words. Hope you start feeling a little better. And greed? Some maybe. But it’s highly motivational. If it was a poem with a single trinket I doubt many would go to great deals or lengths to find it. I would love to find it, just to do it. Sure, the chest and contents would be one heck of a bonus. I would use some portion of the proceeds to help fund more adventures for my family and I would like to think that I would re-secret indulgence and a portion of loot and start it all over again so that others could continue to enjoy the chase. I would have probably already made a trip or two but I’m a person of meager means, that and work requirements it has been tough to warrant spending any money on a hunch. I think I finally cracked the poem recently to the point that I feel very confident. But I’m fortunate that I get to spend most days in places that others only get to spend a few days in a year, and I have a great time just roaming the mountains and discovering the treasures that are naturally abundant. Lastly there may still be a way for you to feel good about your solve without publicly posting and that would be selling it. Not sure who would be interested or what they might pay, or even how you would go about doing it. I’ve even considered that with mine. But ultimately I think it would be grand to just make the time and do it myself. I imagine I would have at least a sense of accomplishment. Sorry for long winded post. The thought did cross my mind. I’m not sure FF would find that very tasteful though. And I still give you a toast keyring !! I can see them breaking down your door for such value. Well I’m more confdent than that. If I was approached with a 500k offer I would even refund if FF says openly my solve was patently incorrect. Again I think I would rather just go get it. Daniel, the treasure is not in Yellowstone, imho. If you want to solve the poem try anagrams. He put butterfly = flutterby into TTOTC for a reason. It took me 2 years to solve the poem, because it was much more complicated than I originally thought. Your a smart guy, maybe it will take you less time to figure out. The treasure is not in a dangerous place. Searchers putting themselves into dangerous situations is the problem. I don’t care what FF thinks about it and that’s part of the problem. Most folks thinks he’s watching over their shoulder and nudging it now and then. I’ll start the bidding at .000001 cent for the solve. Lol, well, I would surmise you’re only short x 10 to the eleventh power to get in a starting ballpark. Might have miscounted all those zeros. Maybe you got the decimal in wrong spot. Ha! But it’s a start. I don’t know that FF would even care, but it doesn’t seem fitting for somebody to just get indulgence because they can buy the way. I dunno. The price just went down. Good luck in your future endeavors…. Paul- notice Forrest uses the word treasure here and not chest. i would like everyone here to keep this in mind moving forward. because if you dont, youre going backwards. DB, My wife and I had a conversation this morning about the poem that makes your statement relevant. Definitely worth considering more. I’m giving up the only solution to the poem I have because it’s been too psychologically harrowing and financially taxing. Psychologically harrowing because I believe the poem to be quite subjective, that it does not have an embedded message language/math experts, cryptography/computer experts can crack. This means a person can read any number of things into the poem and get caught up in following a delusion. Following delusions–even profiting from them–is the province of the more wealthy members of society. A wealthy person off on a wild goose chase gets called eccentric, interesting, and his or her bank is not broken following a whim. A poor person such as myself on the other hand gets called foolish and is sadly looked upon by members of family. Poor people simply cannot afford delusions; delusions can be quite fatal to the poor. Therefore I am giving up my solve so the poorer people on the chase do not make my error, or if they choose to make my error they will be aware of the difficulties. My solution then to the first stanza and warm waters halt is heart spring in Yellowstone. Taking it to canyon down is daisy and fire hole river. No place for meek/creek is iron springs creek. Sun is drawing nigh is sunset lake up iron springs creek. But you look for heavy loads and water high so that is astra/hillside springs. Now here is where it gets interesting. I used the “Fenn/imagination/see images in things” method for the search area. Use google map topography over hillside springs and notice the big horseshoe indention. If you switch to terrain and use imagination it looks like a biddy in profile with mouth open aimed at biscuit basin. It gets still more shocking: Fenn at end of the treasure chapter in book mentions Captain Kidd/Gardiner island. Actually google a picture of Gardiner island area and superimpose it on the hillside springs shot: A match of horseshoe type shape. It gets even better: Look at the picture of Donny staring at camera and where Fenn mentions looking off in the trees in the thrill of chase book. At top right hand corner of photo there is a profile of a person with the same horseshoe type shape mouth area. And still better: I went to the area in question, on foot, and there is a type of entrance area with on left a massive rock formation which has type of gravestone marker type look, and the other side are two stone formations, one suggestive of the image/poem in scrapbook 165 of Fenn, the sculpture and the other something of a Native American’s head (Fenn’s pictures of Indians/braves in woods. Even more strange: There is a small waterfall tucked away up there suggestive of Fenn mentioning his shower having a design deficiency because of open skylight. Even more strange: the whole hillside springs area has three hill type formations which seem to match up with the three marbles photograph in chase book. Still more strange: Look at the stouthearted man photo in thrill of chase book with man thrusting his arm up into a shoe shape, socking it in; the fire in photo the men are singing around plus this socking motion looks like hillside springs geysers in relationship to the horseshoe/biddy face formation. I think my point should be clear: I am not entirely stupid, did not go up to Yellowstone for no reason, and yet, no treasure. That area I went to is suggestive for other reasons as well: It has rocks, gravel running down to base “gate” entrance like hourglass in Fenn constant “Sands of time” theme in his book. The much discussed photo in Fenn book of plane bombing (page 99) looks like mystic falls area by hillside springs when photo is upright, but flipped upside down is suggestive of the horseshoe area I mention. Feel free to find other similarities, more evidence for my solve, or even better, find reasons in the negative because I failed to find the treasure. I just got back from up there, climbed around like crazy, scrambled through and over snow. I might have missed the treasure because it’s quite snowed in. But I’ve had it, it’s just too mentally/emotionally and physically (I’m 54) and financially taxing. I still think the place should be checked out top to bottom, but I’ll leave that to the more rugged individuals. What was really strange when I was leaving the area I looked up on a rock face to the right as you go in and in area of the right “entrance gate” and saw a shining silver formation sort of like the Silver surfer face or Han solo frozen in Star Wars #2. It appears to be a silicate formation but it is uncanny…It’s clear when the sun is shining full on it. It’s not big, but if you look you’ll see it. Marvel gaze? I’m mentioning all this because what am I really expected to say to family members? That I would have found the treasure only if I had gone up to the silver surfer area more closely? Again, only the wealthy can afford the luxury of being so foolish. Someone like me just seems more of a loser than he already is…So there you have it, my yellowstone and only solve of the whole chase. I have never had any serious other solve. I hope this at least prevents anyone from the delusion I entered upon, and at best leads to the treasure for somebody. Of course I hope some of my reasoning here helps if the chest is located in an entirely different location–I hope my way of looking at things helps someone in the hunt. I tried to think it out. Hope this helps everybody. Daniel….your post made me reflect back on all of my experiences with Fenn’s Chase. Personally…I wouldn’t discount any one particular event or adventure that pertains to my time involved. Different strokes for different folks I guess. I also do not believe that this is an activity exclusive to anyone. In fact, I believe that this Chase has afforded an opportunity for *anyone* to participate… in an adventure that inspires folks to experience nature from a whole different perspective. I truly wish you could see this from a different approach….Thanks for making me review my motives. Sorry to see you go Daniel. I wish that your finances were better, and that you could search once the snows have melted – who knows what you might have found. Just being in the Rockies is a treasure in and of itself – at least for me. Thank you, Daniel, for sharing your experience. I can relate. Just this past April, I drove out to Yellowstone from Baltimore. Took me 3 and a half days to get there. I’m a 48 year old truck driver and also very limited on funds. Between the trip there and the trip back, I spent several nights sleeping in my car. My solve was also along the Firehole, but further north than yours. I do plan on returning, so I won’t give away anything specific. Suffice it to say, there are indeed many interesting landmarks, geographical formations and especially place names that line up perfectly to so many of the hints in Fenn’s memoirs, especially TTOTC. My solutions to the 9 clues were very specific and followed one after the other in the order they appear in the poem. Unfortunately, a large part of my “x marks the spot” area was still covered in snow drifts. Needless to say, after 2 days of strenuous searching, I had to give it up. Dejected, on my last night in Gardiner, I went to the bar at the Yellowstone Grille. After I put a few beers in me, I decided to email Dal. I was lucky that someone as gracious as Dal was the recipient, as I would never advise drinking and emailing at the same time, especially after being so discouraged. I ended up giving away most of my solve, except for the last, most crucial part. My distorted reasoning was that I would never be able to make it back for any of the summer season, so I might as well see if I could “share” a second chance with another searcher. Dal was the first one to come to mind. He was kind enough to respond and patiently explained his reasons for not accepting solves from other searchers unless they were willing to share publicly with everyone. After all, how did I know he wasn’t working on the same solve? And if he truly was, and it ended up being correct, I would never believe him! So I really put him and myself in an awkward spot. But again, he was gracious and understanding of my dejected state of mind because, like so many of us, he has been there. He encouraged me not to give up (Thank you again, Dal!). When I got back home (Isn’t it funny how the trip back is always so much longer than the trip there?? ), I quickly realized how much of a financial hole I had dug for myself by taking that trip. I knew I was stretching things, but not to the extent that I actually did. It was a disaster, financially and emotionally. Took me until just about a week ago to get my financial bearings back, and that only with some help. Just from one trip. But I will be back to finish my solution, even if its next year (unless Fenn’s gut feeling holds true and it’s found this summer). And next time, I’ll be better prepared financially and experentially, having learned from my mistakes. The hints you shared from your solve do offer some insights that are useful for my own, so I thank you for being willing to share those with everyone. But I would also encourage you to get back out there when you can. Not with desperation or unrealistic expectations, and not outside of your financial means, but with the thrill of the chase – that sense of adventure and fun. And always remember that you are not alone! We ARE a community of searchers, but there’s nothing wrong with some friendly and gracious competition. This is exemplified by Dal, who has created this site in an effort to share his knowledge, resources and insight with us all, and in which we all share with one another. So you believed that Fenn had wishes of his remains placed inside Yellowstone National Park, interesting. Hello Daniel, I have searched for the treasure since November of 2011, and I have plumbed the depths of every conceivable emotion, both good and bad, during my rambles in the Rockies. You are right: the Chase is not for everyone, but I am certain it does not discriminate based on financial status. Rather, it is a stern challenge from a rugged and highly intelligent man to truly examine ourselves and our motives. Why do we search? What motivates us in life? How resilient are we? Can we take risks? Can we persevere? Are we truly and authentically curious or merely grasping after the potential for fame and wealth? Are we willing to consider a life far from the accepted norms? I could go on and on…But anyone who embarks on this adventure should realize that Forrest Fenn is cut from the same cloth as Hugh Glass, Osborne Russell, and a certain Mr. Brown. These are not men for whom things came easy: daunting struggle and mortality were frequent visitors to their mighty endeavors. And while many might take advantage of the Chase to inspire a wholesome family outing (Bravo!) , the one who finds the chest will have undergone an arduous journey indeed. Hi Stephan, I think my solve should be thoroughly examined by at least somebody. I still feel strongly about it. I mean exactly the horseshoe area behind hillside/astra springs across from biscuit basin Yellowstone. If you read my solve completely, there is plenty more I can add about it, such as in one of Fenn’s scrapbooks he holds up a shoe with the sole area blown out and that matches with the foot on stump with hatchet at end of book, and the area I speak of is similar in image. Furthermore, when you approach the entrance to the area I speak of, it’s similar to a war ground, stones here and there, and hillside and astra smoking on the left side. As you approach the entrance area on the left is a stone formation with a gravestone type outcropping, and on the right side is a “shappened” figure similar to the sculpture/poem in I believe scrapbook 164. As you get deeper into the “wood” of the place, here and there are red, green, black marks, lichen I guess, suggestive of the Olga tea chapter. The suggestiveness of the entire place, resemblance to portions of book, really gets to me. All the stones in front of the entrance sort of look blown out, suggestive of the skippy’s car chapter having the engine fly out after being pulled by Cody the buffalo. I climbed over quite a bit of the place I speak up, climbed up beyond the small waterfall to where the red, green, black Olga tea suggestive coloring was to have a look. I filled a water bottle with waterfall water and drank it–it was good. I’m regretting if I didn’t aim “in the wood” carefully enough. I should have checked the central portion and left upper portion of the place better. But who knows? I definitely think the place needs to be checked out thoroughly, considered either the place or searched to definitively be crossed off the list. It’s just too suggestive. But if people go to the place, please respect it as it really does have the Fenn “Flanders field, stout hearted men struggling into the breech against the grain of sands and time” theme. And leave the buffalo alone near Iron springs creek. One buffalo was hanging out on the hillside by the iron springs bridge I made the couple days I was there. So many images in Fenn’s scrapbooks are suggestive of the place: The picture with hat with hole in it; Fenn talking about his deficient bathroom shower design, open skylight, suggestive of waterfall at the place; scrapbook number 107 and the “U see it” stuff going on with the 5 dollar bill; and of course the shappened image figure in scrapbook 164. Maybe I’m just reading too much into things, but I post all this for people because it’s a major problem in the search. People are too often and dangerously reading too much into things. My reasoning is if I can’t figure it out I’ll be a good team player and try as much as possible to cut down on the delusion which creeps in and help people focus on the actual, and hopefully the actual location of the treasure. I think people working on this should cut down on the selfishness and be more like soldiers on the field, Fenn’s stouthearted type, and work together toward the solution of the problem. I can understand if you really think you know the solution going for the treasure alone, but if you have arrived at bad solves I think they should be made known to the public so people don’t repeat delusion after delusion. Can soldiers in battle, stout hearted men, afford delusion after delusion? I don’t think so and I don’t think Fenn would think so either. I’d like to see a team of stouthearted people really sock into the area I speak of behind astra/hillside springs. Take the place thoroughly; either win it or wipe it out from being a delusion plaguing searchers on the chase. Hi Aaron, one interesting thing about my solve, which is probably just coincidence, not to mention my solve itself just my reading too much into things, is that the place where I made a bridge across iron springs creek has the double omega in stone, the stone work at edge of creek is two half circles and the creek itself makes the lines at base of omega half circles. The snow at the place I speak of–behind astra/hillside springs–covers quite a bit of hunting ground in the horseshoe area still. And you have to be careful when the snow is soft so you don’t crash through among rocks underneath. Be careful if searching there now. Except the Thrill is in the Chase…. not the solve. If all a searcher had to do to discount a place was to look it up in a “database” then why bother with the chase in the first place? Daniel, we visited Astra Springs and the surrounding area while we were in Yellowstone. It is not a far hike from the Summit Lake trail. I’m really happy we did. The springs a very interesting and unearthly. We walked around above and below them. No signs of treasure though. I can send you pictures if you give me your email address. Thanks Daniel, the area I am searching is not too far from that elevation so I will delay a trip. FF has said that we need to look at the big picture as there are many places WWWH and most of them are North of Santa Fe. I grew up in the Rocky Mountains and have a basic knowledge of the area. I also new that when FF said he hid it in the Rocky Mountains one could eliminate a good portion with a basic understanding of the Rockies. Coming from Texas as a small child to Colorado I commented on the mountains that I witnessed only to be corrected by someone much wiser man telling me that those are the foothills. So in your search for somewhere in the Rocky Mountains North of Santa Fe, remember that not all mountains in the Rocky mountains are considered mountains, the whole eastern side is considered foothills. So I took the poem and DID NOT use a map or anything else. I used only the geographical locations to solve each clue and here they are in order. I have gone in there alone with my treasures bold describes Mt Elbert, the highest point (Bold) in the Rocky Mountains that stands BOLD above everything else. So WWWH is at the top of Mt. Elbert. there are also hints to colleges like Mt Yale, Princeton, and others in the area, but I will leave the hints out of the book alone for the rest of this story. I will say that history tells us that this valley was a huge gathering place for Native Americans and numerous tribes and thousands of people would meet here every year. Rachel Plummer described this area in her book 21 Months a Captive. You know Cynthia Parker was here along with her three boys and numerous others from tribes like Cheyenne, Ute, Comanche, Kiowa, and so one. This is the area where council chiefs met and talked about the whites and their Manifest Destiny and how to stop it. Sounds Like an area WWWH to me. It fit both criteria that I needed for confirmation. This has to be it. HELP ME find it!!!!!! So I started with Mt. Elbert and headed down the canyon (not far but too far to walk, so I drove south) to Brown’s Canyon. Directly below the home of Brown in Squaw Creek where the Pike Expedition spent the winter of 1804 and almost starved (no place for the meek) to death. If you but in below the home of Brown one travels up Squaw Creek. There will be no paddle up your creek because Squaw Creek is dry most of the year. So do we have “just heavy loads and water high?” We do!!!! Mount Shavano has a snow feature called the Angel of Shavano. OMG that is the BLAZE!!! Shavano was a medicine man for the Ute Indians and the mountain and snow feature was named after him. Anyway, off I went thinking that maybe this time would be a historical event for my family. I had it all figured out with the exception of the last clue which FF said you would have to be there to figure it out. Well I started off with a hike towards the Angel of Shavano and about 1 mile in I realized I am walking too far so I rethought my final destination and realized the Colorado Trail runs directly below the Angel of Shavano. I thought the Blaze is the trail!!!! I looked for a whole day along the trail and kept thinking about the girl in India response and hiding the treasure in the Appalachian was because just like the Rockies The Appalachian Mountains also has a trail called The Appalachian Trail. I was connecting the dots and crossing my lines to the exact spot. Well you guessed it, I did not find it, but if you agree with me on this location I got you to within one clue away. Let me know what ya think and help me find this treasure so we can all get our lives back. RM’s101 ~’…find this treasure so we can all get our lives back.’ ??? Why do some folks feel this way? I mean, if it is so time consuming, obsessing, overwhelming, why bother? Ocher Spring just north of Yellowstone lake. It wasn’t there and here is how I made the solve. My thought was that camping at a spring is always nice because of the fresh water. If you have ever camped somewhere for a long period of time and had to haul your water you know how important it is to have a spring. I thought maybe FF may have camped as a kid in the area, so off I went 08/2018. I still believe the chest is at a spring somewhere because of the life saving significance. Years ago the head of a spring was the only place to camp or even establish a settlement. It was exciting as I walked along the spring directly to a resting Buffalo. My guess was that he had the same idea I had in reference to the fresh water. When I was within 40′ he stood up and watched me as I walked by. My exit strategy was taught to me by an old cowboy on how to avoid an angry bull. If you don’t know the trick you need to talk to a Cowboy. Like Forrest I think I would have walked right past this great beast if he had not stood up. It was a scary moment for me even though Buffalo are very docile if one is does not agitate the situation. Anyway we said our hello and just as quick goodbye. When I arrived at where the spring started I realized it did not originate from the side of a cliff or even a hill for that matter, but came directly out of the ground in a small valley covered in tall grass. My thought immediately went to the headstone story from TTOTC that FF found in the tall grass. I was excited and at the same time disappointed as I knew nobody would but it here, within a couple of years it would be covered up by nature and lost forever. I did find a buffalo skull and that was a first. I think that old buffalo thought the same way I did and had all the fresh water he wanted. So FF would want families with young children hiking in griz country? I don’t thiiink so. If FF was a fishing guide as a kid in Yellowstone then he was hiking in areas with grizzly’s. He also believed in testing the edges. It’s good to be aware and be prepared, but to avoid the area completely seems like a bit too much fear. Dal – I’m curious where you took the photo for the cover of Too Far To Walk? and I am curious why you have not sent me $10 for the lat/lon of that location? He’s trying to gouge you KH, I’ll give you the lat/lon of WWWH for only $5. Has anyone been able to clarify this with FF ? I would think he would want to correct it if it is skewing the chase.